Whoa whoa whoa, you can't remove that OMM TTC 1.1 texture! That's a crucial piece of the game. Looks like you made a typo with Liveforever. It looks like "iveforever"
looking great ! and i like the cheat list idea ! Old Man Muray reference, it's an easter egg you can read about on the oni wiki. Okay, that's kind of clever. Looking great, keep it up! Haha, I havent "removed" it, just made a list of all the cheats in the game - since they can fit at that resolution. I'm sure I can find somewhere to slap on "OMM TTC 1.1"
But it has to say it next to the crates. Good work, I think I like these better than the last ones because they're not too detailed. Completed. This includes the Training Room. Amazing job. It looks fantastic! It's great! Though I'm still wondering what those cyan-like things on the walls are for. Yeah, that's the texture I'm talking about. It looks a bit weird. did u change the training room too ? cz there's already a HD training room texture package, did u use that one or did u change them ? if so can we have a screenshot. Its completely new - I didnt take from any other mods. 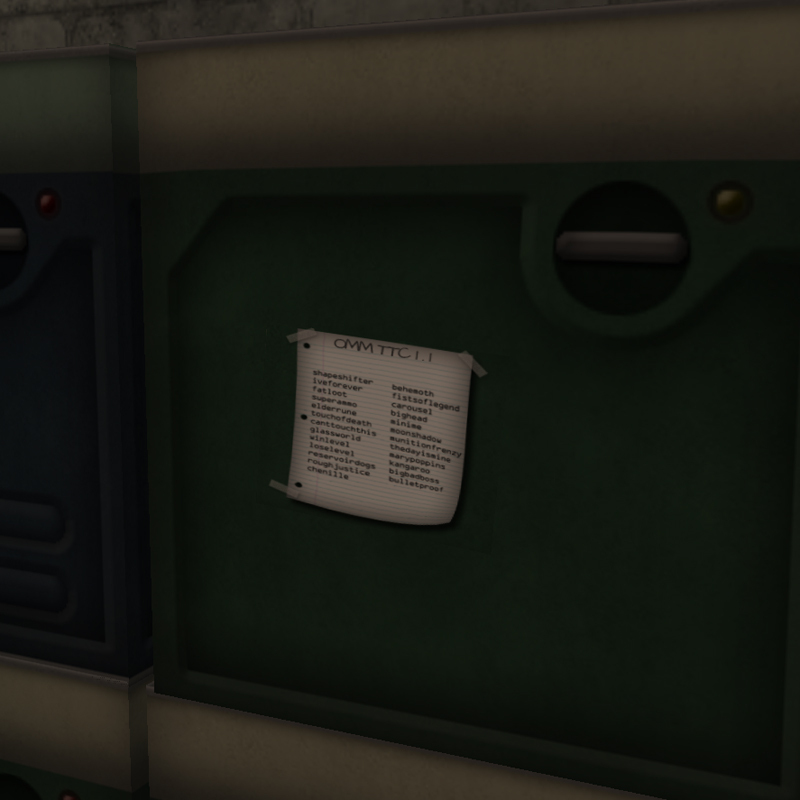 VR's Training Room textures seemed a little harsh? If that makes any sense? So made my own version in my style. I'm away from my main computer right now so I can't diagnose the issue with the transparent textures, or put up screens but I will do so. And can someone see if all the transparent textures are having an issue? Because I can't recreate it.